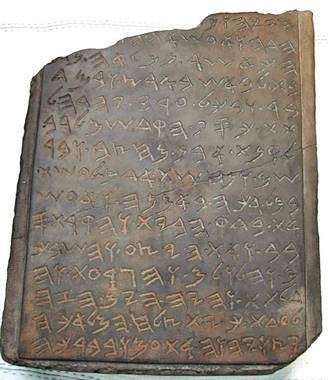 The Haftorah is read from the book of Melachim Beit (Kings II) and is read two weeks before Purim. The Sephardim read: Kings II 11:17-12:17 (21 verses) The Ashkenazim read: Kings II 12:1-17 (17 verses). The Front and Back of a real Shekel minted around time of the 2nd Bait Hamikdash. The connection of the Haftorah to Shabbat Shekalim: This week is the first of the four special Haftorot that we read during the Hebrew months of Adar and Nissan. The names of these special Haftorot are: Shekalim (Shekels), Zachor (Remember), Para (Heifer), and Parashat Hachodesh (The Month). Parashat Shekalim is found at the beginning of Torah portion of Parashah Ki Tisa. It teaches that the Jews were commanded to donate coins valued at half a shekel to the Holy Temple. This mitzvah (commandment) was performed annually for as long as the Beit HaMikdash (Holy Temple) stood. Beginning with the new moon of the month of Nissan* every male over the age of twenty had to prepare his share. The reason for this donation was threefold: 1) It was used as a means of taking a census. 2) It was an affordable tax that unified all Jews in a concerted effort. 3) The funds were used to maintain the Beit HaMikdash. Similarly, in the Haftorah, King Yehoash utilizes the half shekalim collected, to fund repairs for the Beit HaMikdash. * The names of the months of the Jewish calendar were adopted during the time of Ezra, after the return from the Babylonian exile. The names are actually Babylonian month names, brought back to Israel by the returning exiles. Note that most of the Bible refers to months by number, not by name. Athaliah’s (Step)Mother was the Evil queen of the Northern tribes, Jezebel whose Royal Seal is shown here. 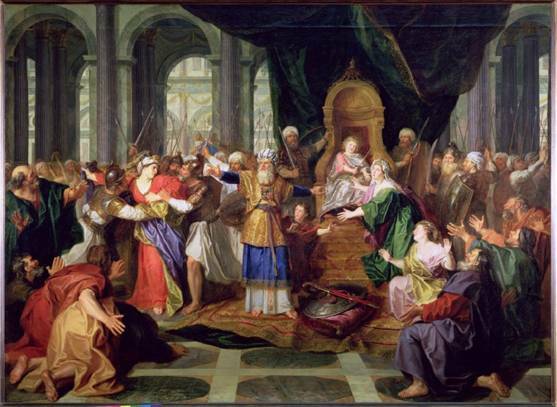 The Storyline of this week’s Haftorah: The king of the northern Israelite tribes, King Ahab & his evil wife Queen Jezebel had a daughter named Athaliah. She married the Judean King Achazyah’s son. Instead of the King influencing her in a positive way, Athaliah set out to kill every last descendant of the Davidic dynasty from which the Mashiach would come from one day. She killed everyone except Yehoash, who as a baby was hidden away in the secret chamber of the Beit HaMikdash (King Solomon’s Holy Temple) to avoid being killed by the evil Jewish Queen Athaliah, The Kohen Gadol, Yehoyada, and his wife, Yehosheva looked after Yehoash until his 7th birthday. On that day he was anointed as King of Judea. Yehoash ruled for 40 years. Just after his coronation, Yehoash made a three- way covenant between Hashem, the Nation of Israel and himself. Yehoash’s “deal” was that the people should not worship idols anymore, they must only worship “Hashem“ God of the Jews. In spite of Yehoash’s very young age, he asked that the people honor his request. Shortly thereafter, many Jews came to the pagan temple of the idol Baal and destroyed it. They smashed the altars and images used in the pagan worshipping; they also slew Mattan, the chief priest of Baal. King Yehoash re-instituted the performance of the ceremonies in the Holy Temple by the Kohanim and Levi’im. The people of Israel then celebrated Yehoash’s appointment as King. Yehoash was a very righteous king. He ordered the Kohanim to use the Shekalim that had been donated to the Beit HaMikdash for Temple repairs. Twenty-three years passed and still the Kohanim hadn’t supervised or used the money to renovate the Beit HaMikdash. King Yehoash summoned Yehoyada the Kohen Gadol (High Priest), questioning why the repairs to the Beit HaMikdash hadn’t been done. Yehoyada had no answer, but he agreed to get the job done. Yehoyada then took a large chest and made a hole in the lid (yes, this is the world’s 1st tzedakah box! - charity box). It was placed on the right side of the entrance to the altar so that everyone coming to the Temple to offer their sacrifices could make a donation. Whenever the chest would fill up with Shekalim, the King’s scribe and high priest would distribute the money to the men rebuilding the Holy Temple. Everyone worked on the honor system. If you would like to learn more about the life of Yehoash, please refer to Divrei Hayamim Beit – Chronicles II, Chapters 23 & 24. Ruled as King of Judah for 40 years, from the Jewish year 3061-3101. He was born in Jerusalem. His father was Ahaziah. His mother was Z'via (Sylvia) of Be’er Sheva. His son was Amaziah. Yehoash died when he was about 60 years old and he was buried in Jerusalem. Haftorahman’s lesson of the week: A message of both the sidra and the haftara is that Jews in each generation have duties towards the upkeep of the Synagogue and other communal causes. Apart from the practical financial benefits this brings, the acceptance of this responsibility has contributed to the inner strength of the Jewish people down through the ages. - Julian G. Jacobs, A Haftara Companion, Aviva Press 1998. Queen Athaliah killed off every descendant of the Davidic dynasty…except 1!